The purpose of the study was to determine whether nature (genes) or nurture (environment) had a greater influence on how people perceived work stress and job satisfaction. Researchers studied nearly 300 pairs of twins — a mix of identical and fraternal twins — who were raised and educated apart. They used path analysis, a statistical technique used to describe the directed dependencies among a set of variables by breaking down correlations into different pieces for the interpretation of effects, to evaluate the connections between genes and environment, job satisfaction and stress, and physical health. 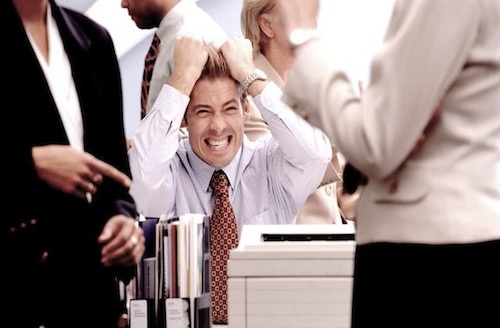 They found that personality type is associated with job stress and health. Self-evaluations indicated that different perceptions to the work environment influenced satisfaction, stress and health problems. Individuals with a low core self-evaluation, answering negatively to questions such as “When I make plans, I’m almost certain that I can follow them through” or positively to questions such as “I often feel as though I have no control over what happens to me”, perceive more stressors in their work environment, which decreases satisfaction and increases stress and health problems. Conversely, people that feel more optimistic and confident, and less self-critical perceive fewer stressors in their work environment, increasing satisfaction and decreasing stress and health problems. This result seems somewhat obvious: confident, optimistic people are typically better at handling stress than those that aren’t. However, what was surprising was that large portion (44%) of the differences in personality type could be attributed to genetics. The researchers found that being raised in the same environment had very little effect on personality, stress and health. Instead, shared genes turned out to be around four times more important than a shared environment. Quite simply, who you are (your genes) is more more important than how you are (your perceptions). Our study suggests strong heritabilities to work stress and the outcomes of stress. This means that stress may have less to do with the objective features of the environment than to the genetic ‘code’ of the individual. This doesn’t mean we shouldn’t do things as employers or individuals to avoid stressful jobs. However, we also shouldn’t assume that we’re ‘a blank slate’ and therefore be overly optimistic about what the work environment can and can’t do as far as stress is concerned. More of it has to do with what’s inside of us than what we encounter outside in the work environment. Based on this research, if you’re genetically predisposed to experience workplace stress, switching jobs won’t solve the problem. Here are some tips to better cope with stress at work. Identify the factors causing you stress by keeping a stress inventory. For one week write down the people, events and situations that cause you to have a negative physical, mental or emotional response. For each entry, write down a brief description. Where were you? Who was involved? How did you react? How did you feel After a week, review your stress inventory. Choose one situation, identify and explore the problem, look for ways to resolve it, and implement a solution. Feeling overloaded is a common cause of stress. Improve your time management skills by setting realistic goals and deadlines for yourself. Review your progress frequently. Every evening before you leave work, prepare a list of tasks for the next day and order them by priority. During the day, limit distractions that make it difficult to focus: check email less frequently and block off time on your schedule for important work or challenging projects. Sometimes work stress can be overwhelming. Talk with your coworkers about your challenges and see how they’re coping. Take short breaks throughout the day to refocus and come back refreshed — take a quick walk and stop staring at that computer screen! Lastly, take care of your health. Get regular exercise, plenty of sleep and eat a healthy diet. Judge TA et al. Genetic influences on core self-evaluations, job satisfaction, and work stress: A behavioral genetics mediated model. Organ Behav Hum Decis Process. 2012 Jan 1;117:208-220. Feeling stressed by your job? Don’t blame your employer, study shows. Notre Dame News. 2012 Sep 13.